Prime Minister Harper has pledged to fix the current fiscal imbalance that exists between the provinces. What is needed is a complete rewrite of the equalization formula that determines how federal tax money is distributed to the provinces. Major complaints with the existing imbalance comes from a number of provinces with Newfoundland and Saskatchewan presenting the best examples of the current inequity. 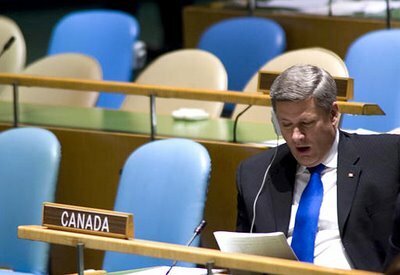 Mr. Harper is having a difficult time resolving this file. IIt's about time the provinces face up to the same challenges that the federal government has to face up to. Til now, the provinces went with hat in hand when they had trouble meeting budget. And they were rewarded. But the provinces should be making the hard decisions. Take the Manitoba NDP government. We now have the highest debt in the history of the province because of their careless spending ways. We also spend more on healthcare per capita than all other provinces. Yet waiting lines and hallway medicine are increasing. The bureaucracy of the healthcare system is astonishing. Until provincial governments start cleaning up their own back yards, I think the federal government should take a very tough stand. Bud - this is not a question of provincial 'spending' ??? Look at a couple of points. your provinical gov't is responsible for highways and grid roads. Yet Ottawa collects a gasoline tax and has NO resonsibility for Manitoba highways - why is the gas tax going to Harper? Why is it that when the formula is calculated, Saskatchewan MUST include the money it receives from non renewable resources BUT NEWFOUNDLAND AND NOVA SCOTIA ARE EXEMPT!! This is not the time to be trying to defend Harper. The Conservatives promised a FIX for Saskatchewan and other provinces and now in typical Tory fashion ooooops... another broken promise!! I didn't for one minute suggest that the current formula is fair. I know there are a lot areas that could be addressed. My point was that there is nowhere the federal governement can increase revenue except our own pockets. So the federal governement gets the crap while the provincial government cries poverty. Sure the ferderal government must change the fairness of provincial funding but the onus is on the provincial government to make sure that money is spent wisely. And here in Manitoba that doesn't seem to be the case. Fair ball - but look at my province of Saskatchewan. From 1982 - 1991 the Grant Devine CONSERVATIVE government NEVER balanced one budget in 9 years AND left a debt of $14 Billion dollars. That debt has now been paid down to $7 Billion. BUT Saskatchewan people had to cut back on health care, highways etc to GIVE THAT MONEY BACK TO THE BANKS! (Oh and 16 Conservative MLA's were convicted of FRAUD and Breach of Trust) - yet we do not get the same treatment as Nova Scotia and Newfoundland undrr the formula. The FEDS are over taxing us by Billions - how else did they have a $13 Billion surplus to go to debt. You may want to cut your provincial government a bit of slack - Ottawa is taking in Billions more than they need - Manitoba is entitled to its share. Don't let provincial partisan politics allow Harper to hurt your province. Have Federal Tories Muzzled RCMP Commissioner?